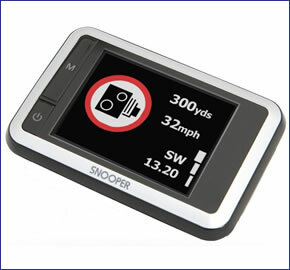 Snooper Lynx GT Lite GPS speed camera detector provides alerts to both fixed and mobile speed camera locations such as Gatso, Truvelo and SPECS cameras via its internal database. The Lynx Lite version updates when you connect and download from a internet enabled PC! The Lynx GT is designed to be windscreen or dash mounted (both options are in the box) and its 2.7-inch full colour TFT LCD screen displays and spoken voice alert provide all the warnings. What's more buy the Snooper Lynx GT Lite from ActiveGPS and receive FREE lifetime speed camera updates - worth £29.99 a year! Snooper Lynx GT LITE has been discontinued. Accessories are still available for your Snooper Lynx here. Snooper Lynx GT Lite speed camera detector uses GPS technology to provide advanced warnings to fixed and mobile speed camera locations. Alerts on the Lynx GT Lite are given both audibly from spoken voice alerts and via the 2.7-inch full colour TFT LCD colour display so you always know what lies ahead. The colour of Lynx GT Lite's LCD display can also be changed, in total there are 10 different colour options. The GT Lite can be powered either via your vehicles car charger or via the built-in rechargeable battery - which provides up to 3 hours operation. Buy the Snooper Lynx GT Lite from ActiveGPS and receive FREE lifetime speed camera updates worth £29.99 a year! The Snooper Lynx GT Lite, like all Snooper speed camera detectors, gets the GPS speed camera data from the Snooper AURA speed camera database - subscription fees and connection to your Windows based PC apply. The database provides advanced warnings to known fixed and mobile speed camera locations across the UK, Europe and in a growing number of other countries across the world. The Snooper AURA database is constantly updated with the latest locations - but you must regularly connect to an internet enabled PC to download the latest update. More information about the subscription charges can be found here or by scrolling down to 'Speed Camera Subscription' further down this webpage. Whilst the Snooper Lynx GT Lite has free lifetime downloadable speed camera updates, it's also possible to add automatic live updates via the mobile phone network. This service comes at a premium costing either £7.99 inc vat a month, £22.99 inc vat a quarterly or £86.99 inc vat a year and is payable to the manufacturer. Do you have a question about the Snooper Lynx GT Lite that's not been answered on this webpage? Please see our speed camera detector FAQs for questions from other customers and visitors. Plus if the answer to your question isn't featured, use the online form to ask us for the answer. Alternatively please telephone 01733 777623 Monday to Friday (9:30am-5:00pm) to speak to one of our sales team. Snooper Lynx GT Lite can be installed in seconds and can be moved easily from vehicle to vehicle. Simply mount the Lynx Lite on the dashboard or the on the windscreen with the mounting brackets provided. Power it from the cigarette lighter socket, switch it on and you're ready to go! To access the Snooper AURA speed camera database you must register your device with the manufacturer and download the database before first use. We also suggest that you subsequently update at least once a week to ensure you are drving with the latest speed camera database. Snooper Lynx GT Lite provides advanced warnings for all fixed and mobile speed cameras locations via the AURA database. The database normally costs either £2.99 a month, £7.99 a quarter or £29.99, however, as a limited special offer if you buy the Snooper Lynx GT Lite from ActiveGPS you'll receive the AURA speed trap database FREE for the life of the product. IMPORTANT: It is fully legal to use, own and operate a speed camera detector in the UK. However, before using the Snooper Lynx GT Lite outside of the United Kingdom we STRONGLY RECOMMEND that you check to ensure that the use of a speed camera detector in other countries is also legal. The Snooper Lynx GT LIte will only operate on Windows computers. Specifically, you must be using Windows XP (32 bit), Windows Vista, Windows Vista, Windows 2000, Windows 7 or Windows 8 / 8.1. Additionally the software will only work with Internet Explorer 6 or Netscape Navigator 6 or above. The Snooper Lynx GT Lite will not operate when using Windows 95, 98, 98SE, Millennium, Windows XP (64 bit) or Apple Macintosh operating systems. Please note: No USB cable is included, however the USB cable that is required is a standard USB to mini-USB cable. Want to add accessories to your Lynx GT Lite? Though remember all the accessories listed above are included when you buy the snooper lynx gt from ActiveGPS. Question: I have Lynx XL which includes free lifetime speed trap updates. How do I get these updates from my PC please? Instructions would be gratefully received. You can read the instruction manual online here. Snooper products are NOT Apple MAC compatible. Question: I have a Snooper Lynx GT lite which I regularly update via my laptop to the free database, but I have noticed that when I often pass the North Yorkshire Police Camera van parked in it's registered locations it does not give me any warning. Should this happen? Because these locations are open to public viewing on the North Yorkshire police website. Or am I able to update my Lynx GT Lite another way so I can get the North Yorkshire police van locations. who mange and update the Snooper AURA speed camera database: support@snooper.eu. Do you have a question about the Snooper Lynx GT Lite? Submit your question via our contact page. Please note: Page 11 of the PDF manual refers to three different Logic Modes. Logic Modes are NO longer available following a firmware update on the Lynx GT. Read more about this change.